It is obvious from the first notes he plays on ìTwentieth Century Bebop,î the opening selection on his debut CD Deserted Island, that altoist Naoki Iwane is a highly original and major new voice on his instrument. 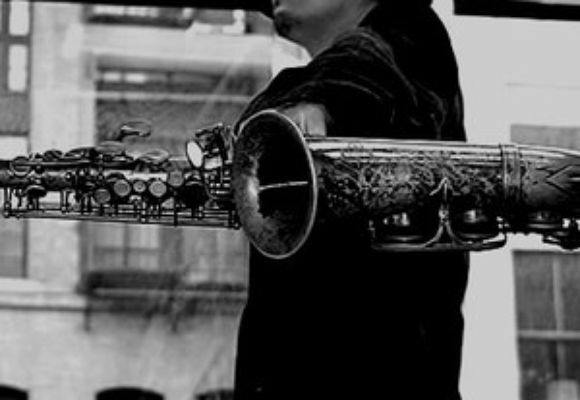 While most young players sound like their main influences on their early releases, Naoki displays a very individual voice from the start, not only as an improviser but as a composer. He does not sound like anyone else. Born and raised in Okayama, Japan, Naoki remembers, ìEarly on I heard classical music. I was enrolled in the Kawai Music School when I was four years old so I could be introduced to music and have fun with it. Then I went to the Yamaha Music School for ten years, studying classical piano and composition. During that same period I also took lessons on drums, playing with rock groups.î After graduation, Naoki moved to Seattle where he attended Seattle Central Community College. Most importantly, he took a jazz ensemble class on drums that led him to becoming very interested in playing jazz. A turning point was when he tried out a neighborís saxophone, immediately felt at home playing it, and bought it for $100 before the end of the first day. After graduating from SCCC, he transferred to the University of Washington to study computer science. However he became so proficient on the alto that he enrolled at the New School University Jazz program in New York City. At the New School, he studied under tenor-saxophonist George Garzone. ìI consider him my mentor. He stressed the importance of time and also introduced me to musical concepts which helped me to really open up my playing.î Naoki was considered such a promising young saxophonist that his recital performance awarded him a position on the New Schoolís promotional CD. For Deserted Island, which features eight of his original songs, Naoki Iwane is teamed with a strong rhythm section and welcomes for guest appearances by Garzone. ìI prefer to play with people who understand my music quickly and who bring more to the music than what I wrote on the paper. That way they are able to be creative in the music. Iíve known pianist George Dulin for a year. As an improviser, he always blows me away and his comping melts perfectly with my solos. Bassist Chris Tordini has perfect time and intonation. Drummer Tommy Crane always swings and is very musical. Iíve known guitarist Kazuhiro Ikeda for five years so he definitely knows my playing well. Iím very happy with this group and the music that we play is definitely very contemporary.î Whether it is the stirring ìTwentieth Century Bebop,î the quirky ìDeserted Island,î an introspective ìSea Watchî or the fiery ìSlip + Slide,î the innovative alto solos, the tightness of the ensembles and the interplay between Naoki and George Garzone are not to be missed. Naoki Iwane, who recently finished his Masters degree in jazz at NYU, has in recent times taught at NYU for a semester, gigged at the Lincoln Center and toured Japan with his group. For the future he says, ìI want to tour all over the world and introduce audiences to my music. I want to play and record music that hasnít been heard before.